Student groups, BU offices collaborate on "Disability is Diversity"
Christine DeRosa/Pipe Dream Photographer Student groups and Binghamton University offices collaborated to hold “Disability is Diversity,” where attendees engaged in activities and exercises geared toward disability education and awareness. Student groups and Binghamton University offices collaborated to host the second annual “Disability is Diversity,” an event that aims to promote disability awareness and resources on campus. Held in Old Union Hall on Wednesday afternoon, the event, which was started last year by Trevon Ferguson, a junior majoring in political science, and Alison Lin, ’18, consisted of activities, discussions and exercises geared toward informing participants about disability and how it can affect lifestyles. This year, Ferguson was joined by the Center for Civic Engagement (CCE), Office of Student Conduct, Multicultural Resource Center, Office of the Vice President of Multicultural Affairs, 20:1, Services for Students with Disabilities, Mental Health Outreach Peer Educators, Delta Epsilon Psi, Alpha Phi Omega, Late Nite Binghamton and Mountainview College Council. As an event coordinator, he worked with residential assistants from every community to get other groups on campus to attend and participate in the tabling. Some tables and activities focused on raising awareness about specific types of disabilities. 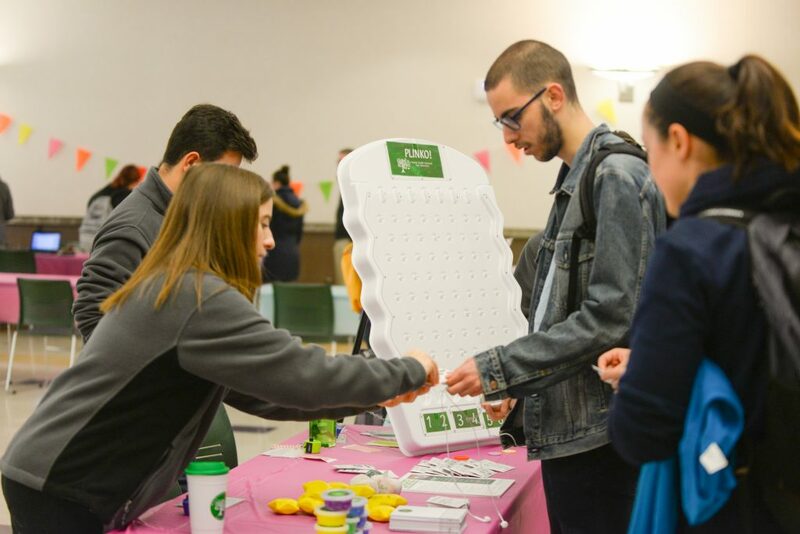 Late Nite Binghamton hosted a table centered on educating attendees about dyspraxia, a neurological brain disorder that results in lifelong memory and motor skills impairment. Participants restricted one of their hands with a glove and rubber bands, and were then asked to type a message on a keyboard and tie their shoelaces. Kristen Seward, a sophomore double-majoring in business administration and philosophy, politics and law who tabled for Late Nite Binghamton, said she thought of the activity as a way of demonstrating the challenges people with disabilities often face in everyday life. The Office of Student Conduct partnered with the CCE and Ask Big Questions, a national organization that works with colleges to facilitate meaningful discussion, to host an activity where people of different walks of life engaged in conversation prompted by questions to think about their similarities and differences. Shaneira DaSilva, liaison for the Office of Student Conduct and a third-year graduate student studying social work and public administration, said the activity was designed to foster discussion of personal differences and help attendees learn how to address differences respectfully. At the Services for Students with Disabilities table, attendees learned to make glitter bottle stress relievers and participated in some breathing techniques. According to Patrick Talvi, a second-year graduate student studying student affairs administration, the activity has already been implemented in Lourdes Hospital and aims to act as a grounding technique and exercise in mindfulness. Jonathan Rubin, a senior majoring in computer science, said he attended the event on a friend’s suggestion and found himself gaining perspective on how others go through life.